Joint Audit Cooperation (JAC) JAC was created by Deutsche Telecom, Orange and Telecom Italia and came to life on January 2010. It is an association of telecom operators aiming to verify, assess and develop the Corporate Social Responsibility (CSR) implementation across the manufacturing centres of important multinational suppliers of the Information Communication Technology (ICT) industry. 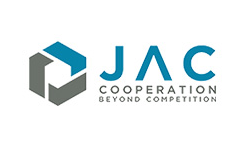 JAC members share resources and best practices to develop long term Corporate Social Responsibility implementation in the different layers or tiers of the ICT Supply Chain globally.